The name remains the same, but changes have been made to Wendy's Bacon Deluxe. The New Bacon Deluxe is "fresh-cooked beef, melted American cheese, hand-leafed lettuce, and sliced beefsteak tomato topped with four seriously thick, crispy strips of Applewood Smoked Bacon on a Kaiser bun." 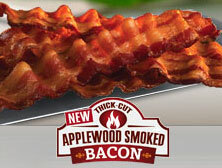 Yup, you caught it: Applewood Smoked Bacon. Not to say I am always proud, but I have been a loyal Wendy's employee for almost seven years. I have seen first hand many of the big changed Wendy's have made in recent years, such as the elimination of the salad bar, flavored Frosties (and in my opinion, a Frosty is chocolate, every thing else is a milk shake) and of course, Applewood Smoked Bacon! You are correct, Wendy's is so excited about this, they even made our crew members wear those dreadfully tacky lapel pins, a big piece of bacon, pinned to your shirt. Terrible is you ask me. I will admit that this bacon taste much better, but the cost has driven prices, and not necessarily sales. As hard as we push, even with a drive through opening line such as "Welcome to Wendy's, would you like to try our new Bacon Deluxe today? It is not working. My theory, why fix something that was not broken?